2 of 5 In nonstick skillet, heat oil over medium heat. Add onions and 1/2 teaspoon steak seasoning. Cook about 10 minutes or until translucent and lightly browned, stirring occasionally. 3 of 5 While onions are cooking, season steaks with remaining 3/4 teaspoon steak seasoning. Broil for 2 minutes per side. Remove from broiler and slice thinly against the grain. 4 of 5 Place pizza crust on the broiler pan and spread with mustard. 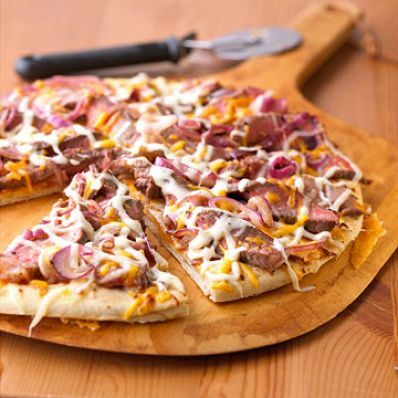 Sprinkle half of the Cheddar and provolone over the top; top with sliced steak and onions. Sprinkle remaining cheeses over steak. Broil about 1 minute or until cheese melts and steak is heated. 5 of 5 Remove to cutting board and cut into six slices.